I love to eat my sabut masoor dal curry with rice and we call it dal-chawal. It's a very nutritious dal being whole that is with the skin. After I started blogging, I came to know from fellow bloggers' blogs that some people sprout sabut masoor dal. Never tried it but love to some day. 1. Wash and soak masoor dal for 1 hour. Drain. 2. In a pressure cooker, place masoor dal, salt, turmeric powder, red chilli powder and 4 cups of water. Pressure cook to about 15 minutes on a high heat. 3. In a pan, heat ghee and add cumin seeds. When they turn darker, add hing. 4. Add onion and fry till pink. Add ginger, garlic and fry for 1 minute. 5. Add tomato and fry till ghee begins to separate. Pour this tadka or tempering over boiled dal and mix. Add garam masala and bring the dal to boil. Adjust the water levels according to the consistency of the gravy that you want. 6. Garnish the dal with chopped coriander leaves. 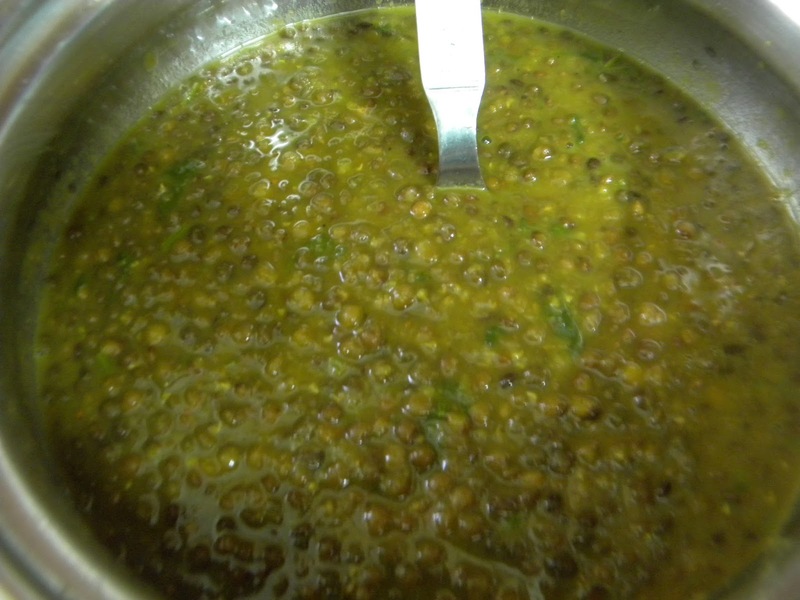 Serve hot sabut masoor dal curry with plain boiled rice or roti.